Remember Kanye West's white stipy "shades", you know the ones that don't even have glass they're just plastic stipes? Well Chanel took the idea of those stipes and tried to make it it's own, then they wondered how they can make this a multi-tasking object, and some genius said "Well golly gee! 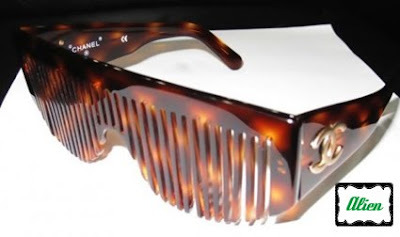 Why not make sunglasses that double as a COMB!" *everyone applauds* "Great idea, son! Being a member of the blogasphere you see a lot of crazy shiznet, but I've never seen something so stupidly crazy. Can you imagine wearing these and having little strands of hair in your eyes, and some hair residue or dandruff? That's always fun right? What I don't understand is that HOW this got approved by CHANEL! Can you say FAIL?